With a lovely common name and shiny pillows of bright leaves, the succulent jade plant inspires admiration. But jade plants (Crassula ovata or Crassula argentea) can be toxic. Kids and grand-kids -- and other humans -- eating or touching these plants might suffer ill effects, and pets should also be kept a safe distance away. The lovely jade plant, a South African native, is very popular in the U.S. as an indoor container plant or an outdoor shrub in U.S. Department of Agriculture plant hardiness zones 11 through 12. It is a broadleaf evergreen with fleshy, water-storing leaves, and can grow to 6 feet tall with appropriate care, well-draining soil and a sunny location. But take care when you touch this low-maintenance succulent, and never eat it. Don't work "death by jade plant" into your next murder mystery plot. These garden gems are only mildly toxic to humans if eaten, according to experts at the University of California, causing minor health issues like diarrhea and vomiting. Touching the plant -- sap, juice or thorns -- may lead to itching and burning skin for some. 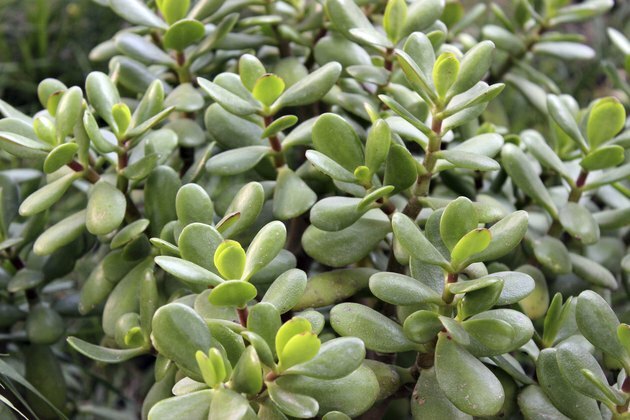 Dogs and cats ingesting the jade plant also suffer from vomiting, as well as depression. Any person or animal suffering such symptoms should be taken immediately to see a health care provider.